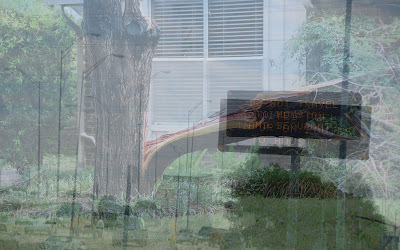 Double exposure: Houston debris from Hurricane Ike and Austin signs warning against travel to Houston. After having watched Hurricane Ike blow into Houston at 110 miles per hour, we did only the essential clean-up and headed for family in the Texas Hill Country (this experience gives new meaning to "heading for the hills.") After three days of pampering (Saara's wonderful food, air conditioning, safe water, laundry facilities and great conversations, etc.) we missed home. In spite of the warnings not to travel to the Houston area, we bought bottled water and non-perishable food, filled up the old Bemer and pointed it toward home. At least we have a home. Some of our fellow Texans do not. When we arrived at the edge of the city, we saw a 30 mile traffic jam. People were heading out of the Houston and the Gulf Coast areas. On the car radio we heard two pieces of great news: we would have water and unseasonably cool weather. This made up for the lack of electricity. We were ecstatic. We have long conversations by candlelight, feeling the cool evening air blow through the house. We read by our battery-powered book lights. We eat tuna sandwiches and listen to our battery-powered radio. We visit with neighbors in our hurricane ravaged gardens. Life in Southeast Texas has changed and I am sure we will find that we have too. Tall Husband and I will not have electricity or the Internet for several more days. Friends, who own a company that now has power, have invited me to use their facilities so that I can blog in comfort. Thanks so much, Guys! Glad to hear things are getting better,and your home escaped disaster.